Happy Eve of Halloween, witches everywhere. I am the new Walpurgisnacht known as Gir Todafunk, testing my capacity hanging upside down while blogging here on the Daily Magi and the Magi Football Blog. Actually, on Monday, I was doing exercises on a high bar I installed as a way to test my flexability. The high bar convertes into a pole for my wife to do pole dancing acts on for me to watch. Right now...I'm in Fresno, at the Residence Inn Fresno, looking at some game film from Fresno State's last game. She likes my company, Nana does. That's why I love her to death. As Hana continues to sleep quietly on the other side of the Pacific, I have a slight confession to make: I called it. I called it. Oklahoma has leapfrogged ahead of us in the USA Today Coaches Poll, which means we are now the No. 2-ranked team in the BCS rankings. Boy, I am a high-bar crazy Girstradamus. I predict while I exercise. Whoa. So right now, there are three teams that are still unbeaten heading into Week 10: Oklahoma, us...and Iowa. The worst-case scenario is that all of us win our our games, and we end up bumped down to third in the final BCS Rankings. That means we're heading off to Pasadena. However, the good news is this: there are only three teams that are now unbeaten, and since we are at the halfway point of the season, anything can happen from now until early December. I'm hoping Oklahoma and Iowa fall in November, so that my guys get another chance at Notre Dame. However, I know that other teams could leapfrog ahead of the Irish, since we already beat them. You know something? I am glad that tomorrow's game is just a regular designated rivalry game and not a Game of the Week. Fresno have had it tough this season with their 4-3 record. We're not going to eliminate their from bowl contention, but we can knock them out of the division race tomorrow. So, with that said, here are my top 10 restaurants in Fresno. No description this time. You can look it up. In my next week, I talk Homecoming. Yes, we're having it this late in the year. And it's against San Diego State. Ohhhhh yes, I love playing against these guys! 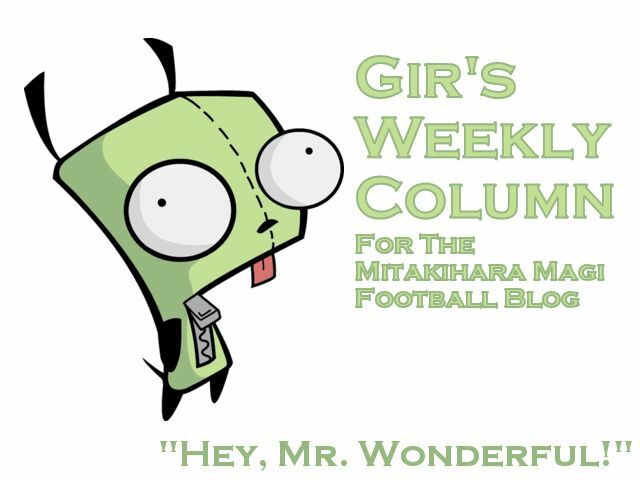 So, be sure to keep an eye out for the Homecoming Edition of Gir's Weekly Columns. I'm Gir, Mr. Wonderful, signing off. You are not alone.